The first wines using the new German wine law provision allowing “Lieu-Dit” (Gewann or Katasterlage) on the label have hit the market. This means getting used to some changes. A "Gewann" or "Katasterlage" is the German equivalent of a “Lieu-Dit”. Long forbidden, a change in the German wine law allows winemakers in parts of Germany to use these names on the label as of the 2014 vintage (we reported on this in the articles "Gewann Names allowed in Rheinland-Pfalz" and "Gewann Names also allowed in Rheingau" last year). 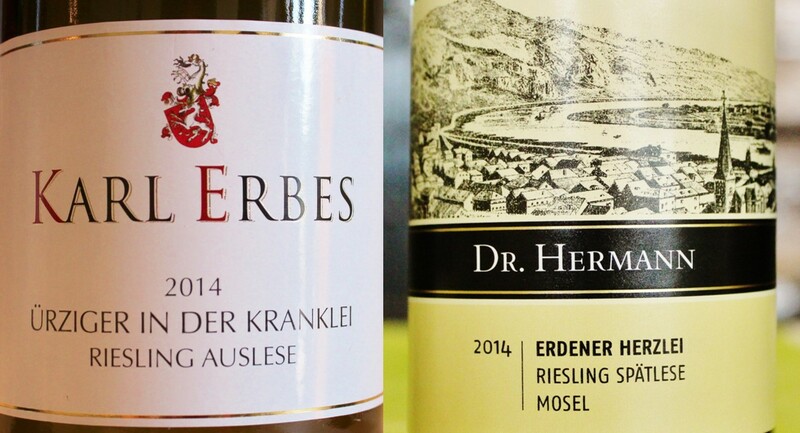 "Ürziger in der Kranklei" and "Erdener Herzlei"
The first examples of "Gewann wines" have appeared on the market. This includes one from the Gewann “Herzlei”, a prime 0.5 ha section in the Erdener Treppchen and one from the Gewann “in der Kranklei”, a privileged 2.2 ha section of the Ürziger Würzgarten. As you can see on the map here below, both Gewann / Katasterlagen are close to the coveted Erdener Prälat. Those familiar with the portfolio of the Weingut Karl Erbes and Weingut Dr. Hermann will recognize a similarity with their former Ürziger Würzgarten “Kranklay” and Erdener Treppchen “Herzlay”. The denominations Kranklay and Herzlay had only been tolerated. They are now, as far as we could understand, no longer allowed. Hence the change. As you can see, both winemakers took advantage of a provision in the law which allows to only mention the village and the Gewann on the label - in this case Ürziger in der Kranklei and Erdener Herzlei - without the underlying single vineyard. They did this to reconnect with highly regarded pre-1971 single vineyards, namely the Kranklay and Herzlay, and to extract these prime parcels from the "vast" Ürziger Würzgarten and Erdener Treppchen, two great vineyards in their own right which have unfortunately been significantly extended with lesser parts in 1971. From a consumer’s perspective, this has more than a subtle effect as it will mean learning all about (de-facto) new single vineyards. Few Gewann in the Mosel-Saar-Ruwer - Many potentially elsewhere! All these Estates had been using the respective Gewann name already on their label since a few years. So the potential for confusion to the consumer should be very limited. However, the situation could be quite different in other parts of Germany. Overall, there have been over 100 (!) names registered in Rheinland-Pfalz so far and also the demand in Rheingau looks to be very strong. It will be interesting to see how many will effectively end up on the label. For those interested to learn more about the Gewann / Katasterlage and why they have been introduced, we published a detailed background article explaining the idea and rationale behind the concept in the Mosel Fine Wines Issue No 26 (Oct 2014). This Issue is available to all subscribers on simple request. If you are not yet a subscriber, you can become one, free of charge, by simply registering here below.